Dhwani likes Avocados,I usually give her guacamole with chips or just cut into cubes and sprinkle some salt n pepper.This week I packed for her lunch box with some soft healthy avocado chapatis/parathas with her another favorite beetroot kurma (I make it less spicy for her) and few mini pretzels.You can also serve with some flavored raita with avocado parathas.Hope your kids will love, try and let me know! In India Avocados are known as Butter fruit but they are little big in size.Avocado are high in healthy fats and on of the worlds healthiest foods.It is loaded with mono-saturated fatty acids which are good for a healthy heart. Besides, avocados are rich in potassium, fiber, antioxidants and many vitamins like B, K, C and E.
Disclaimer: I am not a nutritionist or a dietician, I am doing what is best for my kid to create a balanced lunch. 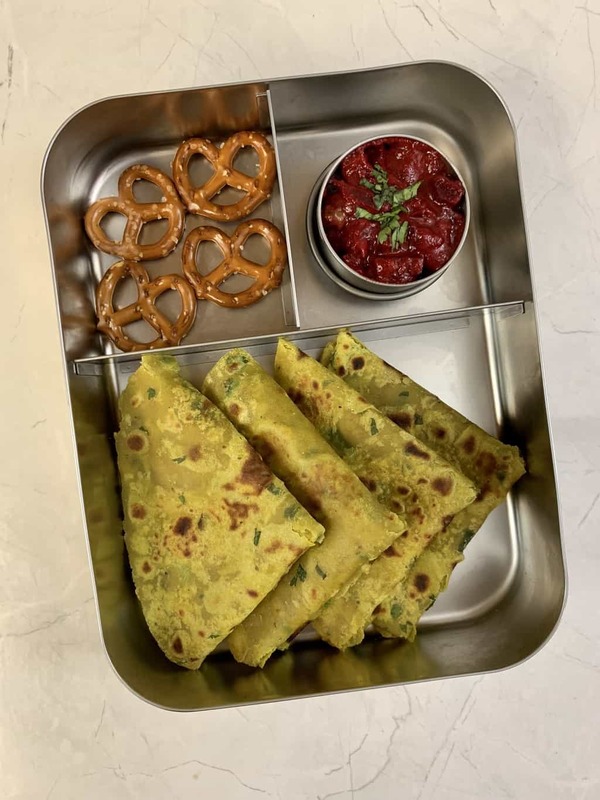 LUNCH – Avocado Parathas – Avocado Paratha is an Indian Whole Wheat Flatbread prepared by kneading whole wheat flour and avocado pulp together with few spices. It comes out very soft, requires less oil and healthy. It is perfect for breakfast or kids lunch box.Please find detailed Recipe here. LUNCH – Beetroot Kurma – Beetroot kurma is an appetizing, spicy curry that you can use as a side dish for flat breads, pooris, roti, chapati, or plain rice.I made it less spicy for my kid.Please find the Detailed Recipe Here.I have made this recipe in Instant Pot (Pressure cooker).I have also given details how to make Kurma in Indian pressure cooker in the same link above. SNACK – Mini Pretzels – are kind of snacks loved by many kids.You can add any other snack thats available at your home. You can prepare dough in the night and refrigerate in a airtight container. Chop the beetroot previous evening and refrigerate. You can increase or decrease quantity based on your child’s appetite. Packed in a stainless steel tiffin box called Lunchbots which is Eco-Friendly, Dishwasher Safe, BPA-Free and is easily available on Amazon .Do not use plastic lunch boxes to your kids, they are toxic. For the soft chapati, it is important to cover the dough and set aside for at least 20 minutes.